Don't Miss These Provocative Books in 2015. Outlined below is the fourth annual Animal Reading List. This follows 2012's exciting lineup of books challenging conventional approaches to animal ethics and advocacy, 2013's posthuman bonanza, and 2014's expanse of critical animal theory, interspecies relationships, and effective advocacy for animals. 2015 has yet to prove itself to be as fruitful as the last few in regards to critical animal studies. Does this mean "the animal turn" has been but a five year trend in scholarship or that many 2015 books are yet to be announced? It's hard to tell, but there is so much material from 2014 that you'll be too preoccupied with good reads to really notice any lag. If you are interested in receiving and reviewing any of these books for the Journal for Critical Animal Studies, please send me an email. Interspecies Ethics explores animals’ vast capacity for agency, justice, solidarity, humor, and communication across species. 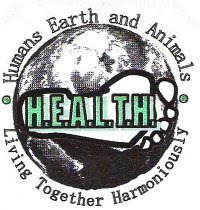 The social bonds diverse animals form provide a remarkable model for communitarian justice and cosmopolitan peace, challenging the human exceptionalism that drives modern moral theory... Interspecies Ethics develops a communitarian model for multispecies ethics.. 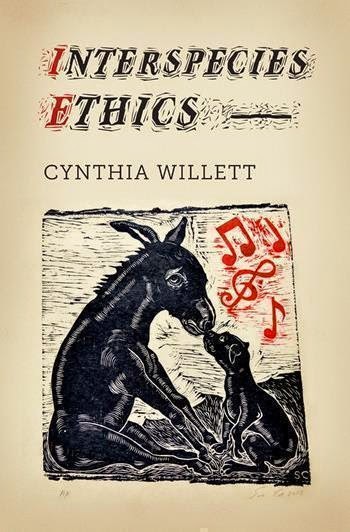 The book’s ethical vision offers an alternative to utilitarian, deontological, and virtue ethics... illuminat[ing] a variety of theories and contrasting approaches, tracing the contours of a postmoral ethics. In Entangled Empathy, scholar and activist Lori Gruen argues that rather than focusing on animal “rights,” we ought to work to make our relationships with animals right by empathetically responding to their needs, interests, desires, vulnerabilities, hopes, and unique perspectives... Gruen describes entangled empathy as a type of caring perception focused on attending to another’s experience of well-being... When we engage in entangled empathy we are transformed and in that transformation we can imagine less violent, more meaningful ways of being together. 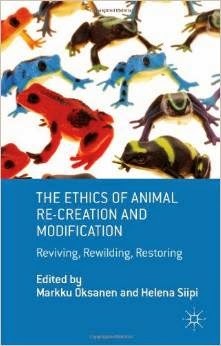 The Ethics of Animal Recreation and Modification studies philosophical and ethical issues arising from new technological possibilities to repair the loss of animal diversity. Several research groups are currently working toward re-creating extinct animals such as the woolly mammoth by the methods of modern genomic technology and of selective breeding. These projects challenge the main underlying tenet of conservation ethics: the extinction of a species is irreversible. For this reason alone, the idea of de-extinction, or reversing extinction, is troublesome. Critical Animal Geographies provides new geographical perspectives on critical animal studies, exploring the spatial, political and ethical dimensions of animals’ lived experience and human-animal encounter.... Chapters draw together feminist, political-economic, post-humanist, anarchist, post-colonial, and critical race literatures... In doing so, the book pushes readers to confront how human-animal relations are mixed up with overlapping axes of power and exploitation, including gender, race, class, and species. Dangerous Crossings offers an interpretation of the impassioned disputes that have arisen in the contemporary United States over the use of animals in the cultural practices of nonwhite peoples. It examines three controversies: the battle over the “cruelty” of the live animal markets in San Francisco's Chinatown, the uproar over the conviction of NFL superstar Michael Vick on dogfighting charges, and the firestorm over the Makah tribe's decision to resume whaling in the Pacific Northwest after a hiatus of more than seventy years. Claire Jean Kim shows that each dispute demonstrates how race and species operate as conjoined logics, or mutually constitutive taxonomies of power, to create the animal, the Chinese immigrant, the black man, and the “Indian” in the white imagination. 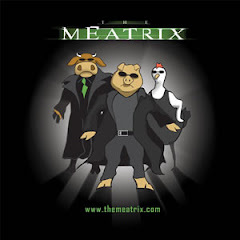 While much has been written on environmental politics on the one hand, and animal ethics and welfare on the other, animal politics, as the interface of the two, is underexamined. There are key political implications in the increase of animal protection laws, the rights of nature, and political parties and movements dedicated to animals. What are the implications of the increasing attention and popularity of ethical discourses on animal welfare and animal rights for politics and political philosophy? What is the animal's place in environmental political thought – and in 21st Century political philosophy per se? 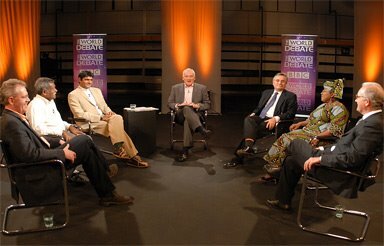 What can, rather than should, politics do for animals – what institutions and practices are suitable and desirable? Can animal ethics learn from animal politics? Bringing together leading experts from a range of disciplines, this volume identifies the key barriers to a definition of moral respect that includes nonhuman animals. It sets out to increase concern, empathy and inclusiveness by developing strategies that can be used to protect other animals from exploitation in the wild and from suffering in captivity. The chapters link scientific data with normative and philosophical reflections, offering unique insight into controversial issues around the ethical, political and legal status of other species. His is not a human politics of the animal, but an integrally animal politics, freed from connotations of the "primitive" state of nature and the accompanying presuppositions about instinct permeating modern thought. Massumi integrates notions marginalized by the dominant currents in evolutionary biology, animal behavior, and philosophy—notions such as play, sympathy, and creativity—into the concept of nature. As he does so, his inquiry necessarily expands, encompassing not only animal behavior but also animal thought and its distance from, or proximity to, those capacities over which human animals claim a monopoly: language and reflexive consciousness. For Massumi, humans and animals exist on a continuum... [which] requires a new logic of "mutual inclusion." Zoogenesis: Thinking Encounter with Animals offers radical new possibilities for encountering and thinking with other animals, and thus for the politics of animal liberation. Examining the machinations of power that legitimize the killing of nonhuman animals, Zoogenesis shows too how thoroughly entangled they are with the 'noncriminal' putting to death of human animals... Iveson thereafter explores the possibility of interventions...that potentially make it unthinkable that living beings can be 'legitimately' slaughtered. Focusing on the socialization of the human use of other animals as resources in contemporary Western society, this book explores the cultural reproduction of human-nonhuman animal relations in childhood. 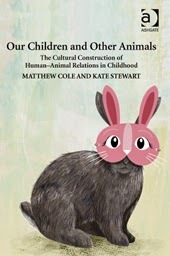 With close attention to the dominant practices through which children encounter animals and mainstream representations of animals in children's culture... Our Children and Other Animals reveals the interconnectedness of studies of childhood, culture and human-animal relations. In doing so it establishes the importance of human-animal relations in sociology, by describing the sociological importance of animals in children's lives and children in animals’ lives. For the first time, a historian of science draws evidence from across the world to show how humans and other animals are astonishingly similar when it comes to their feelings and the ways in which they lose their minds. Thankfully, all of us can heal... How do these animals recover? The same way we do: with love, with medicine, and above all, with the knowledge that someone understands why we suffer and what can make us feel better. 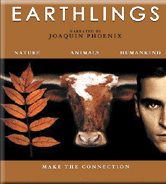 This book consists of a series of essays by internationally recognized authors and activists...focusing on how the seemingly disparate issues of human, animal, and environmental rights are indeed connected. Authors also provide practical guidance about how to make the individual, systems, and social changes necessary to effectively create a peaceful and just world for all.